YOUR BATHROOM IS THE MOST DANGEROUS ROOM IN YOUR HOME! 235,000 people are seriously hurt and rushed to the ER each year because they slipped and fell in their bathroom. It’s no wonder, with the slick and wet floors and tile even slipperier from soap residue, sharp corners of the cabinets and the hard porcelain tubs, sinks, and toilets. 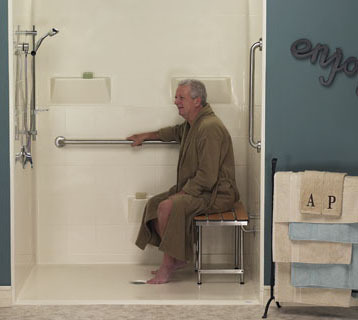 SENIORS ARE AT AN ESPECIALLY HIGHER RISK OF SLIP AND FALLS AND BATHROOM INJURIES, this is why ensuring bathroom safety has to be an integral part of remodeling or modifying your home. 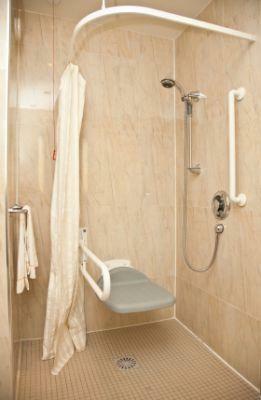 Barrier Free Modifications offers a wide range of bathroom safety modifications. 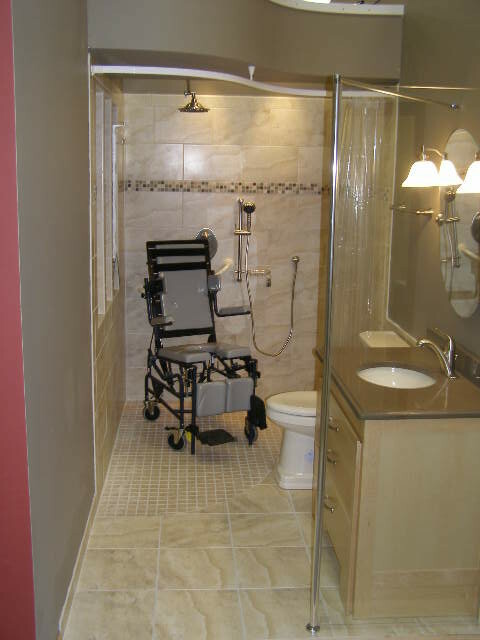 Barrier Free Modifications can work with you to modify or redesigned your bathroom for walker and wheelchair access. 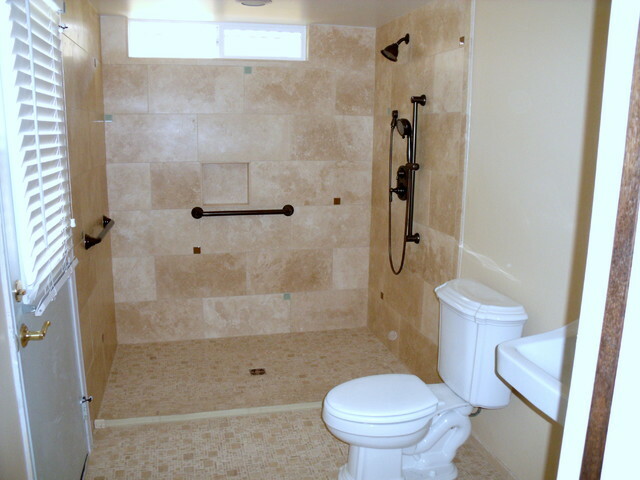 Modifications to the bathroom will help avoid injury and is our most requested service. Let’s start at the bathroom door. Wheelchairs need a minimum 32″ door for a straight in approach. If the doorway is located in the typical hallway and requires turning a wheelchair, you’ll need a 36″ door. Doors too narrow Barrier Free Modifications will widened your doors for wheelchair and walker access. We remove the existing door unit and trim. We may have to relocate the light switch or cut out some drywall to accommodate the wider door, then install a new wider door unit and trim. Paint all new work and repair the finished flooring. You’ll need flooring material to match. With our experienced carpenters this will take about 8 hours to complete. Many times we find a door that can only open 90 degrees because it opens against a wall. This leaves the door end still in the frame opening. If you only need a couple of inches Barrier Free Modifications can use swing away door hinges that will swing the door completely out of the opening. Bathtubs can be very hazardous. 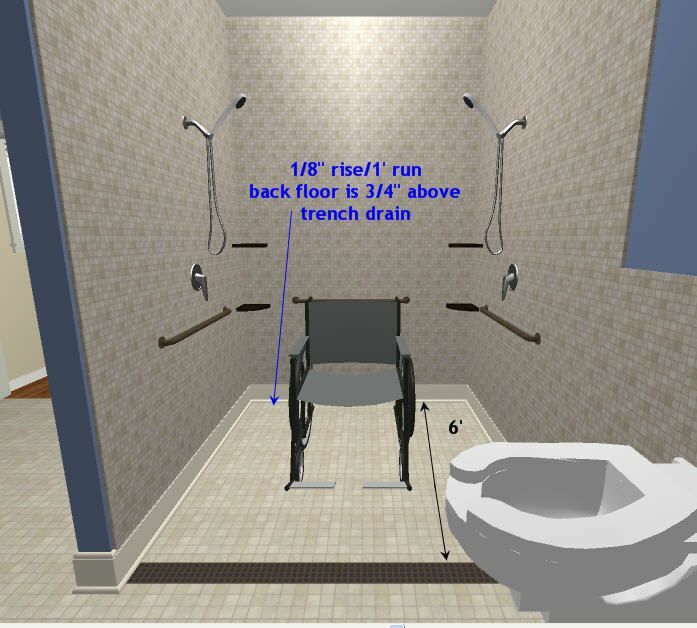 Transferring from a wheelchair to the tub can be difficult. The tub area must be carefully designed to provide maximum safety. 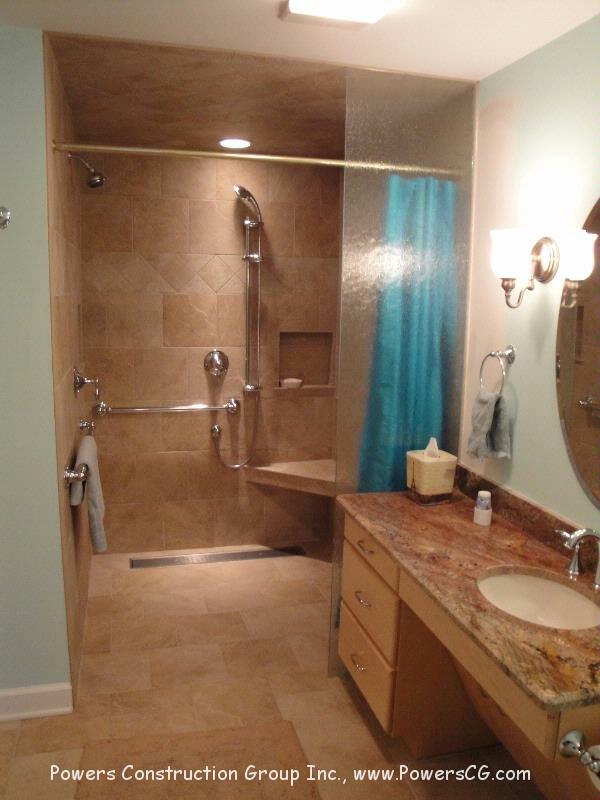 Bathtub and shower grab bars can be installed to provide support. 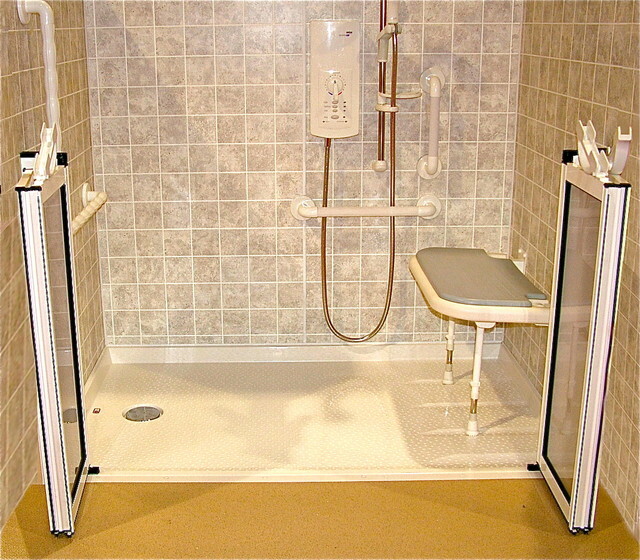 Tub transfer seats allow persons to sit in the tub and take a bath or shower without having to lower themselves to the tub floor. Many people find it difficult to use a tub. Bath tubs can be replaced with showers. It can be difficult for some of us to step in and out of a bathtub because of the high tub walls. 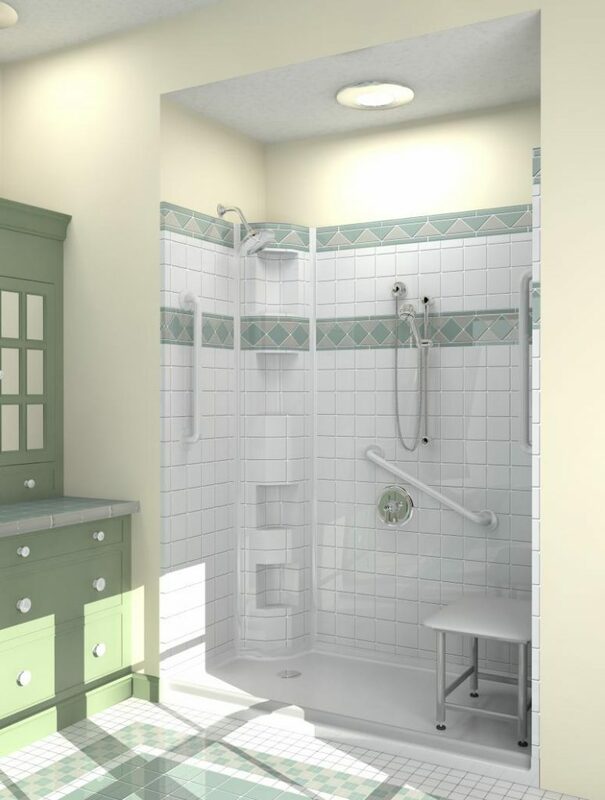 Barrier Free Modifications can make it easier by replacing your tub with a shower. 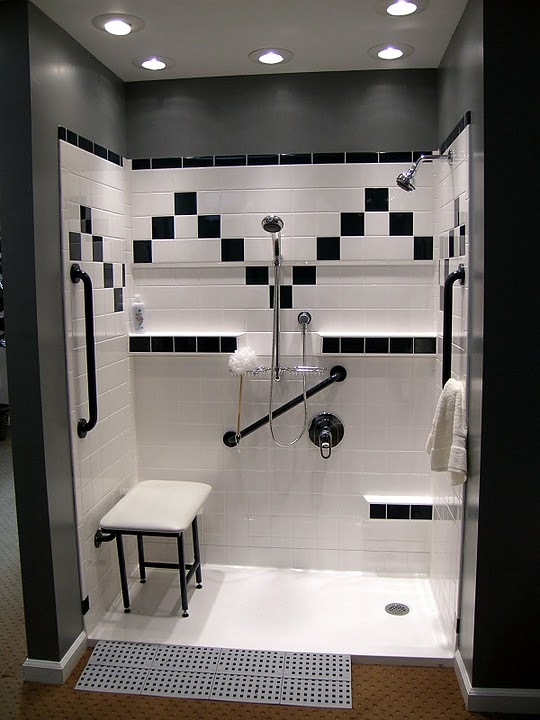 Barrier Free Modifications custom designs and builds our showers depending on your site conditions. 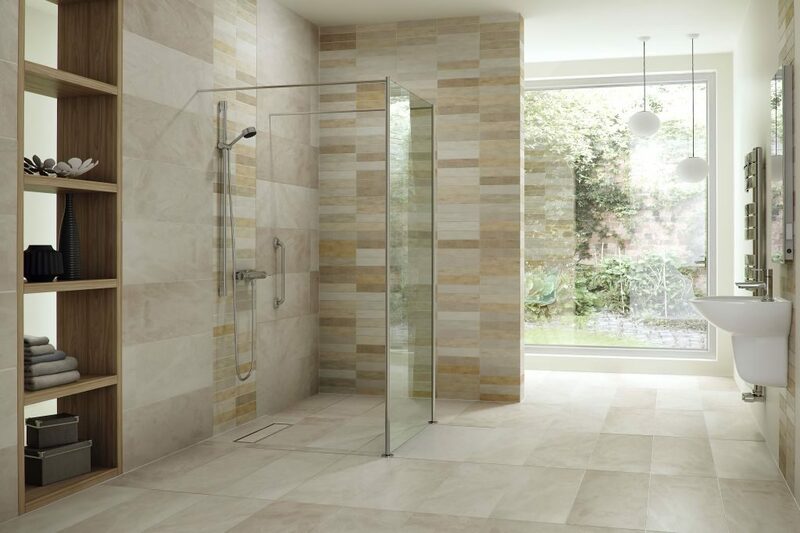 The configuration of most existing bathrooms will limit the size of the shower to the tub area (standard tubs measure 30″ to 34″ x 60″). 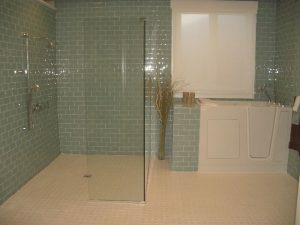 Barrier Free Modifications also can supply and install our own prefabricated molded acrylic/fiberglass shower units. 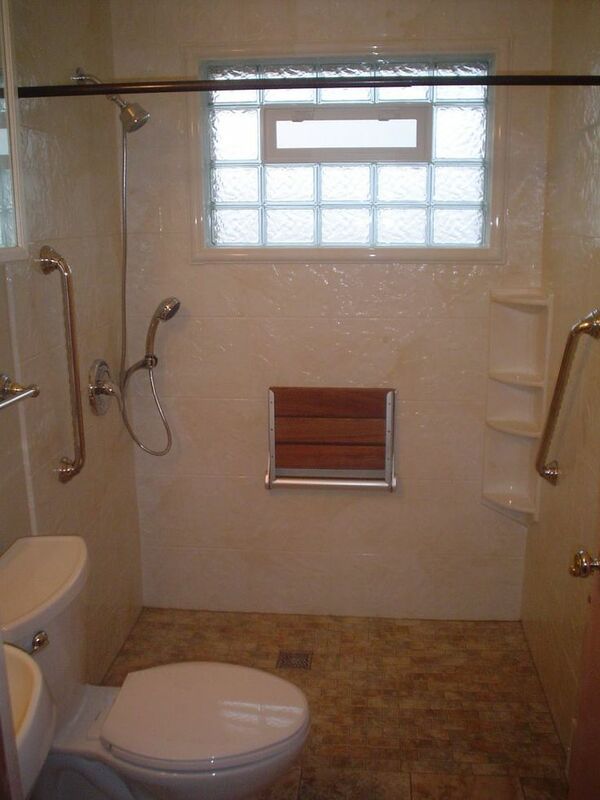 Some include built in shower seats. When remodeling, a 3 or 4 piece sectional unit can be used and assembled in order to get the shower through the door openings and into your bathroom. 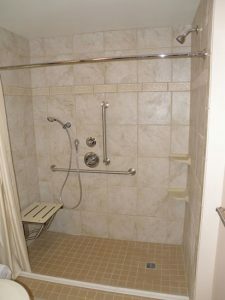 Roll-in showers can be more difficult to install and use. 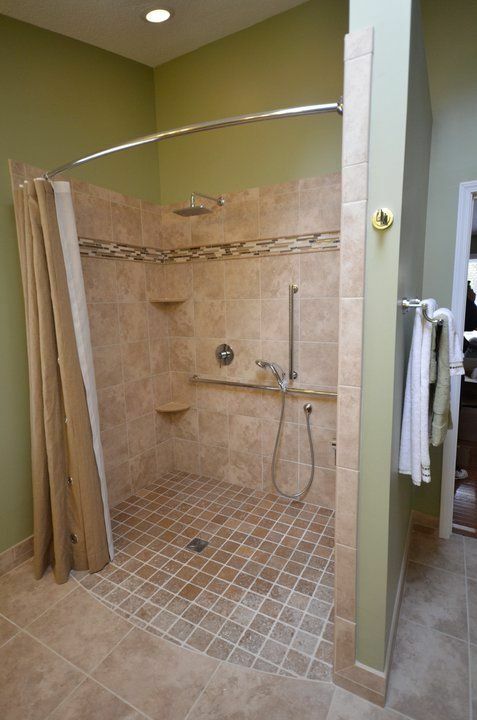 We suggest a shower with a curb but, there’s times when a roll-in shower is your only option. 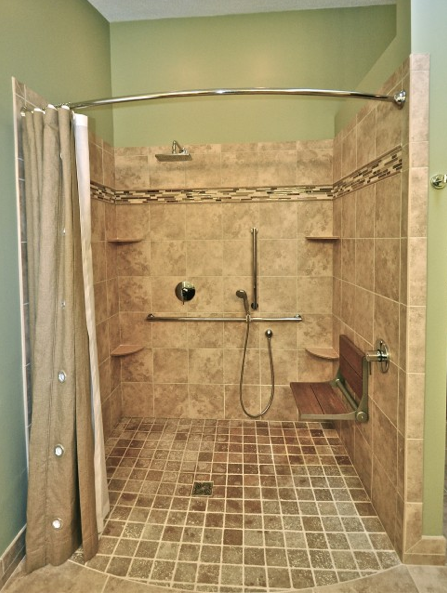 There are problems associated with roll-in showers in a remodeling situation. 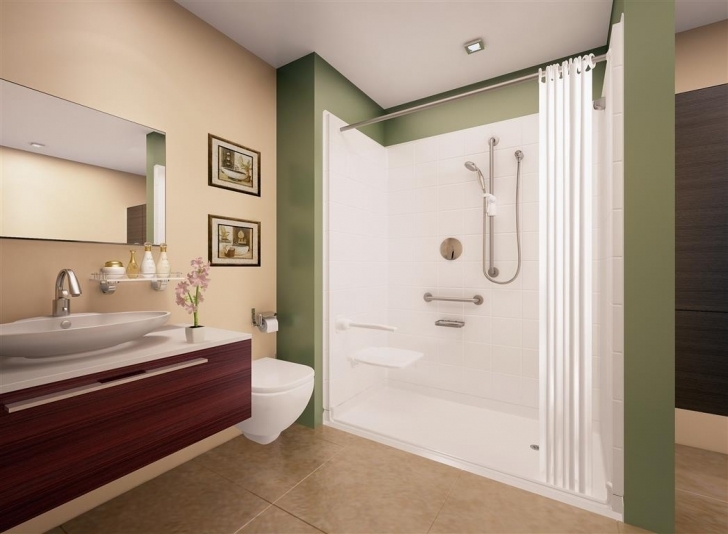 The size of most existing bathrooms limit the options to a tub to shower conversion. 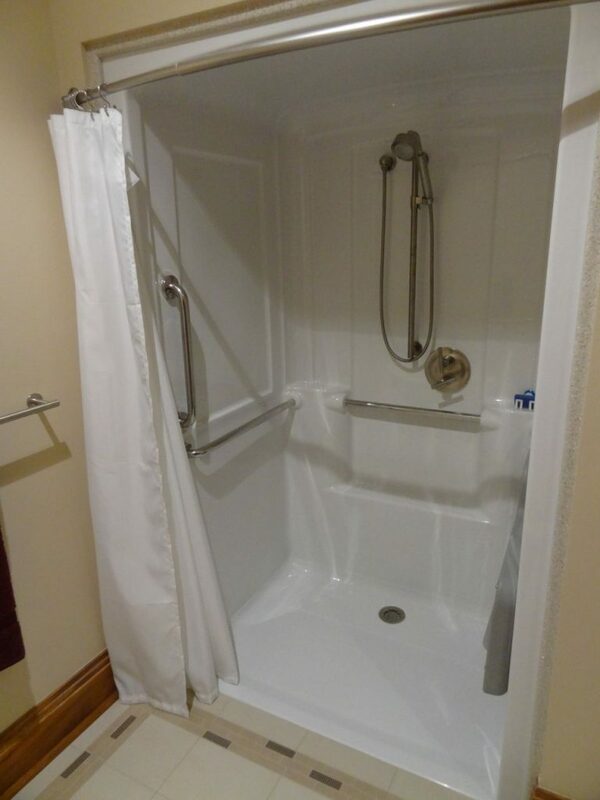 This limits the dimensions of the shower to the same floor area as the tub. A wheelchair will fit into the area but it is tight. The bathroom floor will get wet. 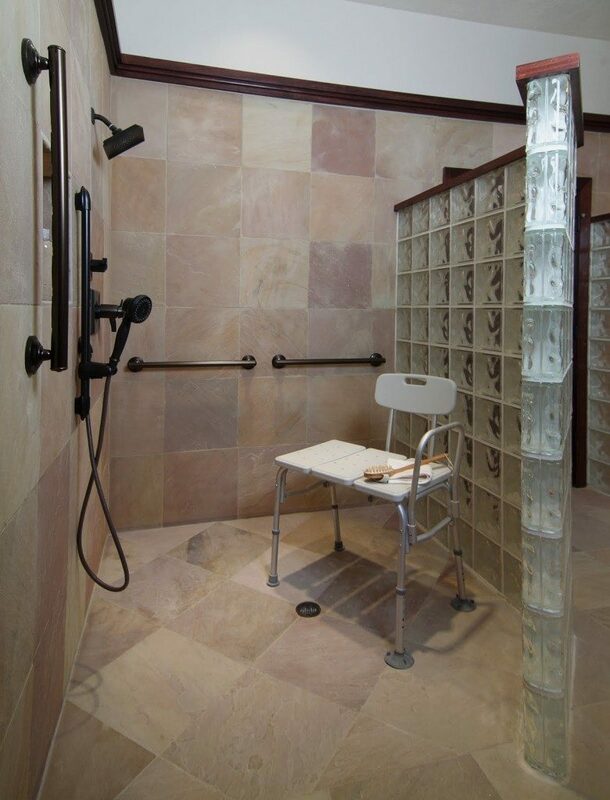 Barrier Free Modifications can custom build ceramic tile roll-in showers using the same basic procedures as used for a shower with a curb. There is additional work required. The tub drain is usually the same elevation as the bathroom floor, requiring jack-hammering and removing the concrete, center and lower the drain, install a rubber shower pan and the new shower floor flush with the existing bathroom floor. 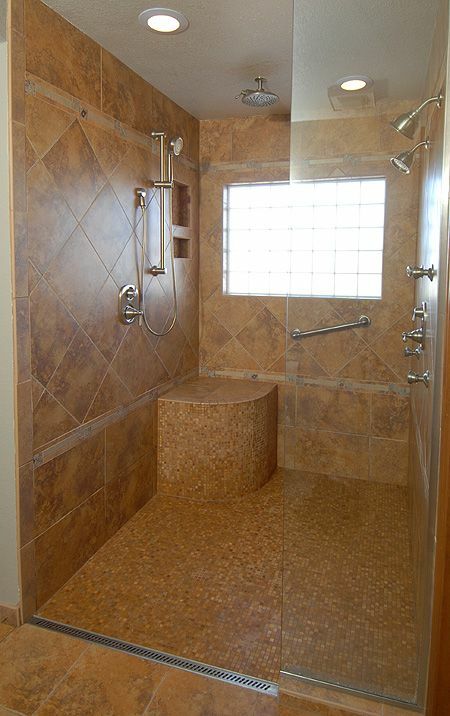 Prefabricated, fiberglass/acrylic roll-in shower floors can be considered. They can replace and are available in the same size as your standard 5′ tub, and comes with a right or left hand drain. This makes it easier since no jack hammering is required and only minimal drain adjustment is needed. If you have the room, these units are also available in assorted sizes. Toilet seat height requirements vary from one individual to another. Standard residential units are usually 17″ high. This can be too low for some making it difficult to get up. 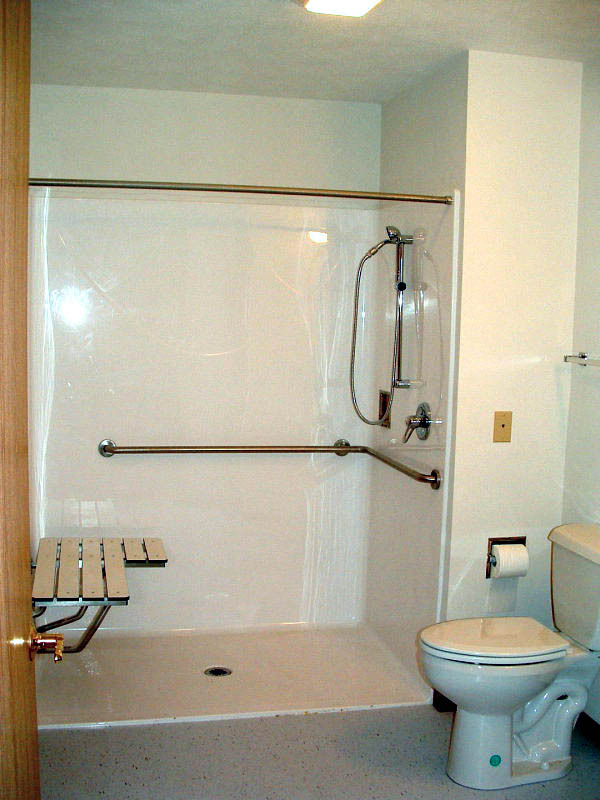 Consider replacing it with the 19″ ADA toilet or installing a raised seat. Many toilets are located next to the tub. 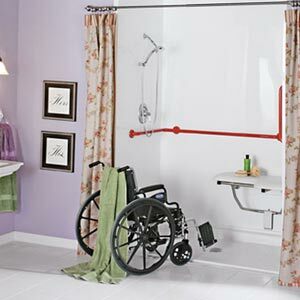 We find that our #30-30 wall to floor grab bar can be very useful when installed between them. It not only helps at the toilet but also getting in and out of the tub for balance and support. 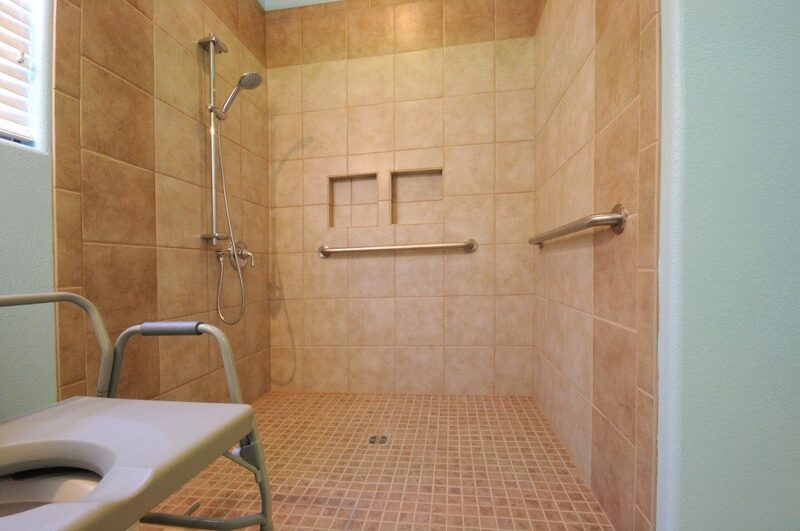 The 30″ length will put it just to the front of the toilet and not limit access to the bathtub..
Sinks can be installed to allow wheel chair access. Vanity cabinets can be removed from below the sink. This will expose the plumbing pipes requiring covering with insulation or boxed in to prevent contact with sharp edges and burns by hot water pipes. 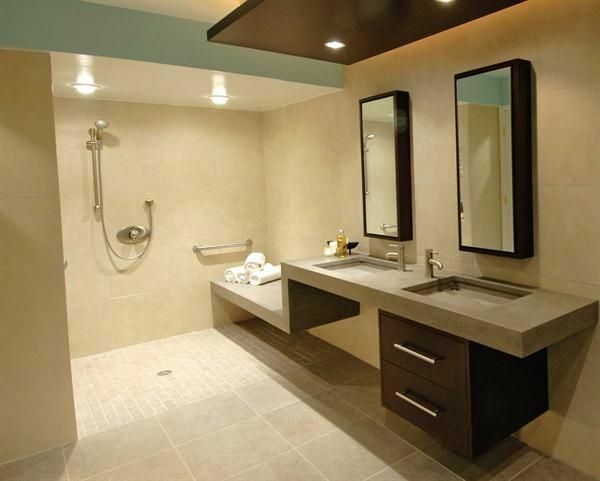 Pedestal style sinks can give you a little more room to maneuver, but can be difficult to use from a wheelchair and are usually a couple of inches higher than the standard vanity top. Barrier Free Modifications suggests a wall mounted lavatory. Faucets can be replaced with single lever controls. Consider the use of anti-scald temperature controls that prevent the water temperature from exceeding an established limit. 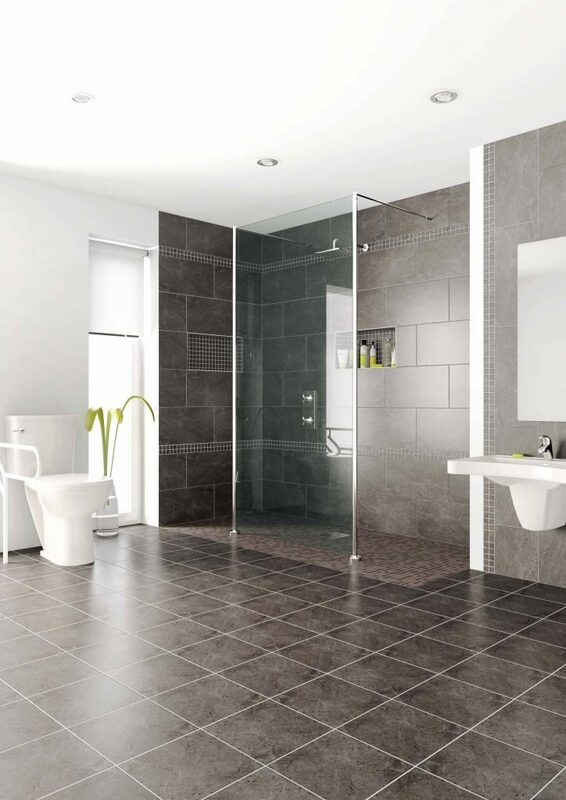 Barrier Free offers modifications on showers, sinks, tubs, toilets and much more. Please call today to speak to a representative to see all there is to offer and all of the benefits to be discovered. Discuss your concerns and worries with us and we will come up with the best fit for your needs. 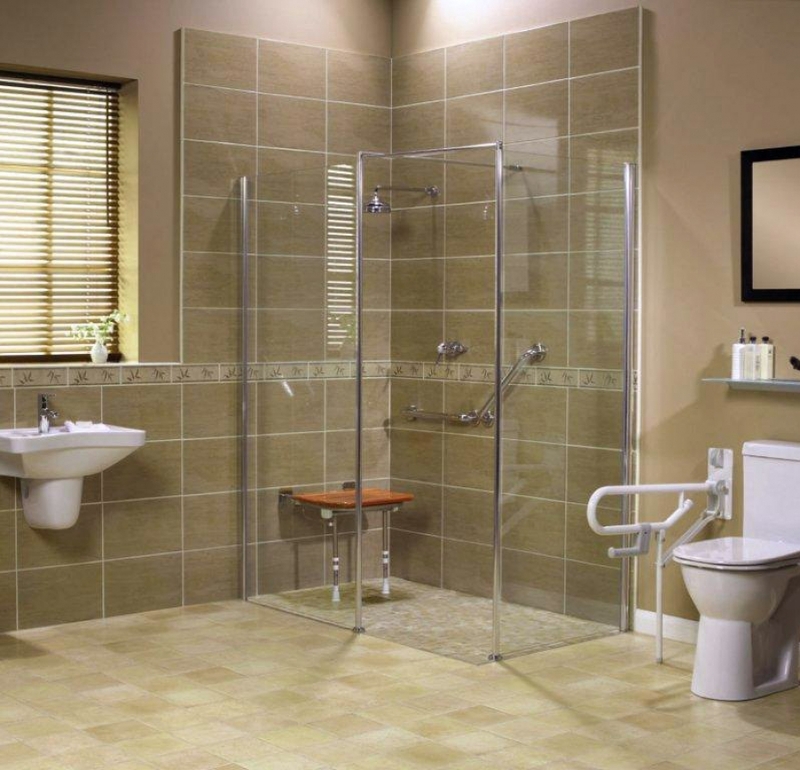 Barrier Free Modifications offers our customers a wide array of bathroom safety modifications. 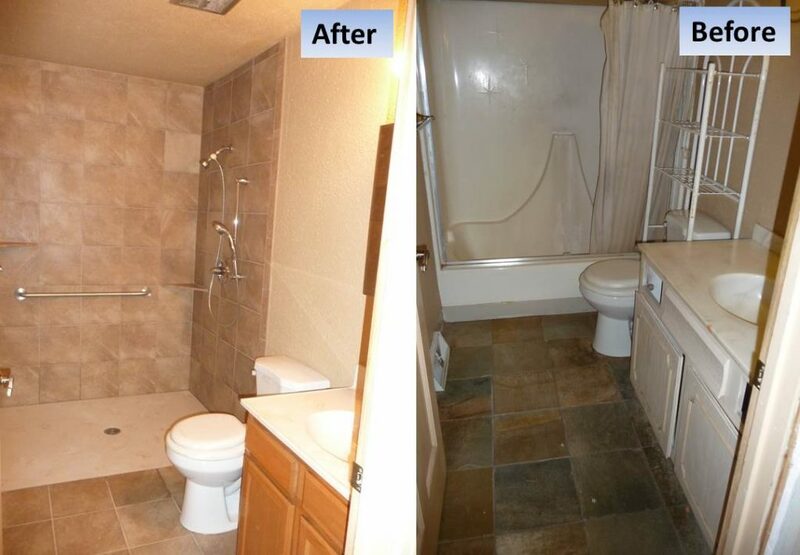 Modifications made to your bathroom can help you to avoid injury and is our most requested and needed service.